We have been a bike riding family since our son, Matthew, who has Agenesis of the Corpus Callosum, was a baby. It's something we all three love to do! We started taking family bike rides around our neighborhood when our child was about 9 months old. Matthew loved going for bike rides on the back of his daddy's bike in his carrier (with his adorable little bike helmet--personalized with a "Matt Cool Cat" nametag, made by his dad). We would even load up our bikes and take them with us on vacations. deer that wander right in the backyard of the vacation homes we stay at, among many other fun things to do. But, sadly, after several years, our wonderful family bike rides came to a screeching halt when our child outgrew the baby/little kid bike carrier, and he could no longer fit inside the typical small bike trailers! Matthew was, however, able to ride a Rifton 3 wheel adaptive trike--at about 7 or 8 years of age, (with close standing supervision from his dad or I), but he was not able to ride a two wheel bike (like some kids, who have ACC, also have challenges with). We still very much wanted to find a way to have the opportunity to continue our fun ♥ family ♥ bike ride adventures. So, we went to bike shops (here in town and also in Sunriver) to inquire about larger bike trailers--plus we even tried Matthew in some of the typical bike trailers (that appeared a bit larger), but he was just too big to fit comfortably inside. 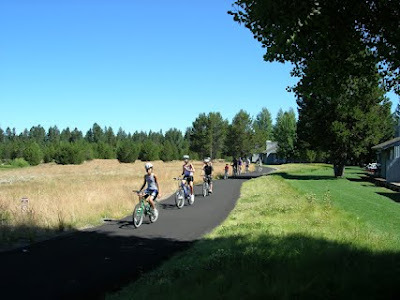 The disappointment I felt during one of our Sunriver (no family bike ride) trips, fired up my engine of determination to find a bike trailer for our child that would fit him and our family's needs, allowing us to pedal those bike paths to our 3 heart's content, with one very special big boy sweetheart in tow. 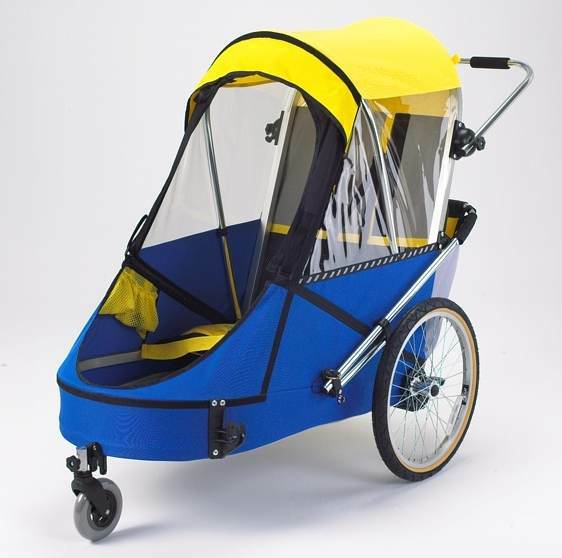 Well, during my motivated "mommy won't give up" (online search) I was ecstatic when I finally discovered a big, beautiful, blue and yellow bike carrier, especially for people who have special needs, made by a company in Ontario, Canada, called Wike! Our dream of family bike rides was once again actually going to come true!! Plus, Wike also sells additional bike trailer accessories to meet the extra needs that some children with special needs might require. We happened to mention to our son's developmental disabilities case manager one day (when he was younger) during a home visit that we found a Wike special needs bike trailer and at the end of the home visit she surprised our socks off by generously informing us that they had a one-time end of the year funding available and if we would like the Large Special Needs Bike Trailer for Matthew, they would purchase it for him!?!? Wow! We could hardly believe their amazing generosity. We were astonished and super thrilled and very grateful! Thanks to the county developmental disabilities program, our son (who was about 10 years old at the time) got a brand new Wike Large Special Needs Bike Trailer with the stroller/jogger conversion (which we love). That was over eight years ago. Our son is 18 years old now. 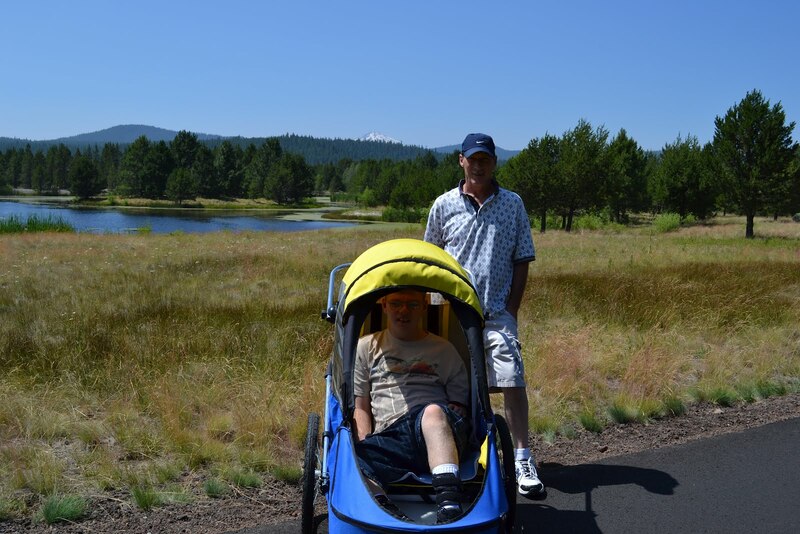 Truth be told -- if the developmental disabilities family support program didn't fund the bike trailer for Matthew, we would have gladly spent the money out of our own pockets just to be able to resume our very special love of family bike riding with our son. 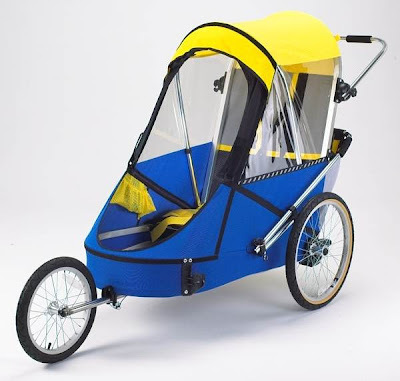 A marvelous feature on the Wike Special Needs Bike Trailer (that is a Godsend for our son, who gets mega-bitten by the dreaded mosquitoes, resulting in numerous big swollen bug bites) is the awesome built-in mosquito net to keep mosquitoes away from your little (or big) sweeties. It definitely works! That positively perfect feature allowed our family to take an evening summer stroll in the (mosquito thick) high desert, enjoying the village shops and music--while keeping our sweet son--who is a mosquito magnet--safe inside his bike trailer the entire time, with no mosquito bites! If there are mosquitoes within a mile of our son, they will find and devour him--but not anymore (when he's inside his Wike bike trailer with the mosquito proof net). *blows a kiss to Wike* This Mama thanks you very much! This summer in July, we once again put the bike trailer in our truck and headed to Sunriver for a mini 4 day vacation. While relaxing on the back patio of the home we rented, we were treated to the sight of a mother and father Quail with their very quick baby quail chicks all in a row (about 12+ chicks total--hard to count the speedy lil things). Then, while on a "Mama by myself" quiet walk on the path along Lake Aspen, I stopped and admired several tiny baby ducklings upon the water, working hard to swim through the top covering of green algae; their mommy duck nearby, and later on was startled at the sight of a deer grazing just across the road from me--who got spooked and skipped off across the pavement near me, leaving the imprinted sound of horses hooves in my mind. Plus, during my walk I was also completely captured, and caught by surprise, at the breathtaking sight of horses running free across a large, open meadow. 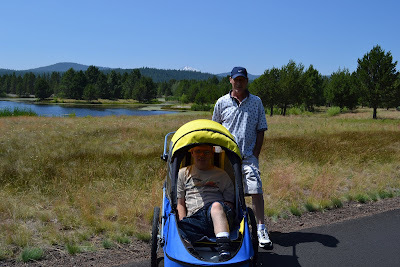 On this recent Sunriver trip, we discovered that this will most likely be our growing son's last year in the Large Special Needs Bike Trailer, since he's nearing the maximum height and weight capacity limit of 5 feet 4 inches and 125 pounds. How do we know that? Well, because while pushing our son in it, stroller style, (and when we were helping him to get in and out of the bike trailer), it became too easy to tip backwards if our teenage son slightly moved around inside, if you weren't at the back of the carrier, at all times, holding the push handle firmly. Wike also sells an Extra Large Special Needs Bike Trailer that will accommodate a person who is up to 150 pounds maximum, with a maximum height of 5 feet 10 inches tall. Note: the extra large special needs bike trailer does not convert to a stroller or jogger. What do we love about the Wike Large Special Needs Bike Trailer, besides the obvious? Our son enjoys riding in it. We don't trust the plastic bike trailer brake to hold securely. 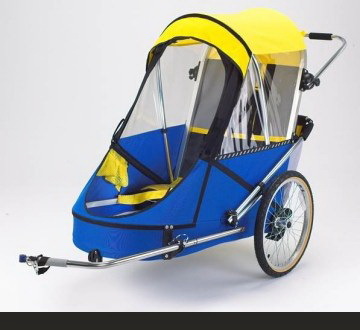 that Wike would make a stroller/jogger conversion upgrade possible for the Extra Large Special Needs Bike Trailer. Over the past few years I have seen other families mention the same longing that we experienced in not having a way to include their child with special needs on family bike rides. It's very special to know that there IS a large bike trailer out there made by a wonderful company, Wike, who cares about the different needs of families and who created an incredible special needs bike trailer, allowing very special family bike rides (for the entire family)! Thank you very much Wike in Canada! We love you -- and your special needs bike trailer, too! Note: please be advised that I did not receive compensation of any kind from Wike (or Sunriver Resort either). This blog post is provided in the hopes that it might bring about awareness (from a family's perspective who have a child with special needs) and it is offered as a possible resource for other families who are searching for a special needs bike trailer, like I once was for our family. P.S. 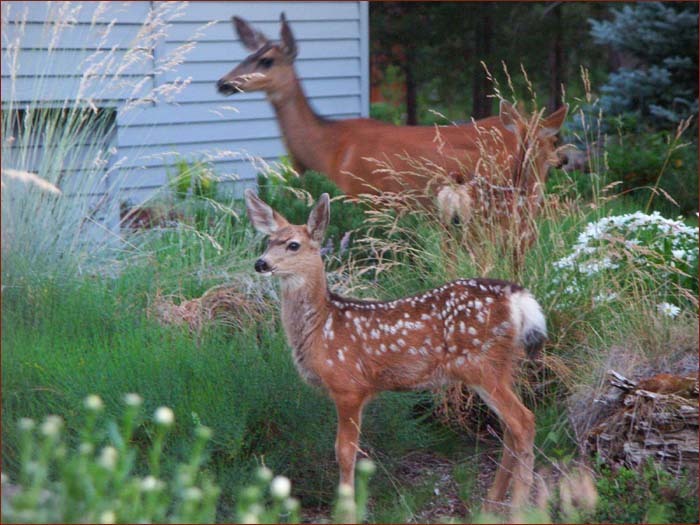 At the beginning of September we will be eagerly heading back to our new favorite house in Sunriver for more spectacular nature-filled bike rides, picture-taking, wide-eyed deer gazing, picnics on the patio, night star viewing at the Oregon Observatory at Sunriver--a one-of-a-kind facility--located just past Lake Aspen, (a short and easy walk down the road from our rental house), plus leisurely walks along lakeside pathways, swimming at the new Sunriver SHARC indoor/outdoor water park (Matthew's favorite), and for even more family fun -- because this time we are bringing along Matthew's Grandma and Grandpa!